oxmyx64 has no other items for sale. Details about 2014 Doctor Who Special Edition 12 Month Wall Calendar w Protective Envelope! 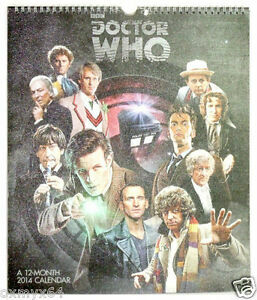 2014 Doctor Who Special Edition 12 Month Wall Calendar w Protective Envelope! Items paid for w/PayPal will ONLY be shipped to buyer's confirmed shipping address! If purchasing multiple items, DO NOT proceed to checkout until you have received a combined invoice from me for total price, plus combined s&h! Buyers who send payment w/o receiving a combined invoice will NOT receive combined shipping discount or partial refund! Combined shipping only available on items purchased w/i 7 days of first item. Combined shipping discount may not be available on bulkier items.